Two updates in one, since I’m such a slow blogger. In February my poem Waiting for the Rodeo was longlisted for the Ron Pretty Poetry Prize and this month my story No Other Men in Mitchell was shortlisted for the Australian Shadows Awards in the Short Fiction category. The winners of the Ron Pretty Poetry Prize have been announced. Waiting for the Rodeo is still out on submission to magazines and I’ll update here if it is accepted for publication. Nightmare issue 41. 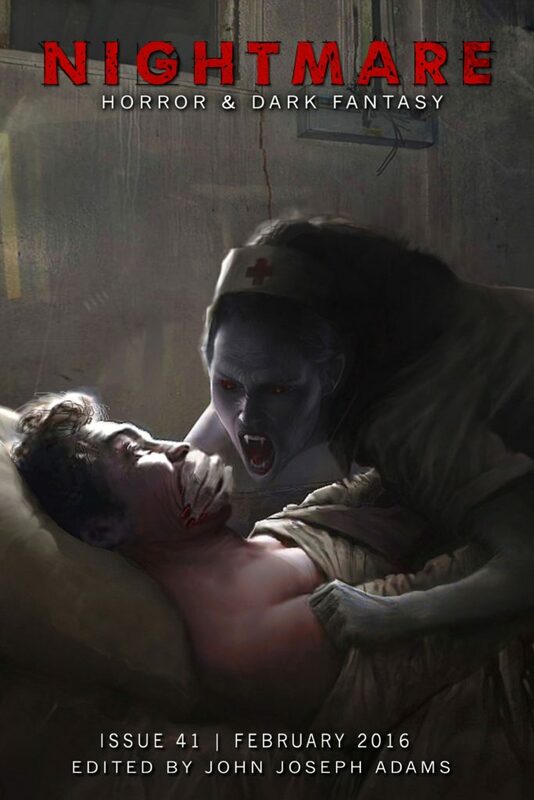 That’s my poor protagonist on the front cover, getting harassed by a freaky nurse. In 2016 I had one short story published, No Other Men in Mitchell, in Nightmare issue 41. Disclaimer: I am a judge for the 2016 Aurealis Awards. These recommendations are my personal opinion and do not necessarily reflect the opinion of any judging panel, the judging coordinator, or the Aurealis Awards management team. *Spoiler alert: the exploding cow is a true story. © 2019 Rose Hartley. All rights reserved.